Our range of Thermal POS rolls are made from a high quality 57gsm paper and have a sensitive thermal coating. They feel quite smooth to touch and can be difficult to write on with a pen. The black image is created by heat from the printer activating this coating, and enabling the text to show. If you are not sure whether your POS roll is thermal or bond, you can swipe your finger nail quickly over the surface of the roll and if it produces a black mark then it proves that it is thermal paper. Our Thermal POS rolls guarantee at least a 2 year life span of black image legibility. However if the rolls are subject to heat and/or outdoor use then the legibility may fade quicker. It is essential that you store thermal paper correctly before and after use to prevent the paper from being damaged by heat or light. They are suitable for all types of EFTPOS terminals and we have a variety of sizes available to suit most applications. In order to measure a POS roll, you need to meaure the width of the roll (the face of the paper that your printer prints on from side to side), then the outer diameter of the roll, and finally the inner diameter of the core. 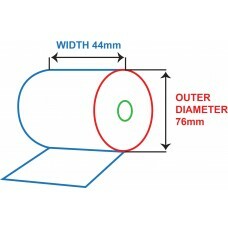 So an 80mm x 80mm x 12mm roll would mean that the width of the paper is 80mm, the outer diameter of the roll is 80mm, and the inner core is 12mm in diameter.